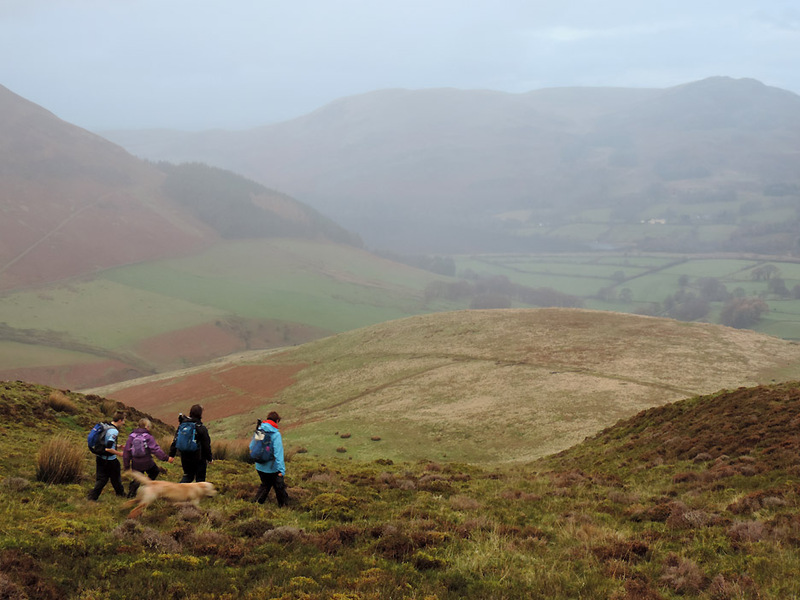 " Loweswater Fells with Paula and Sue." Location of Start : Fangs Brow roadside parking near Loweswater , Cumbria, Uk. 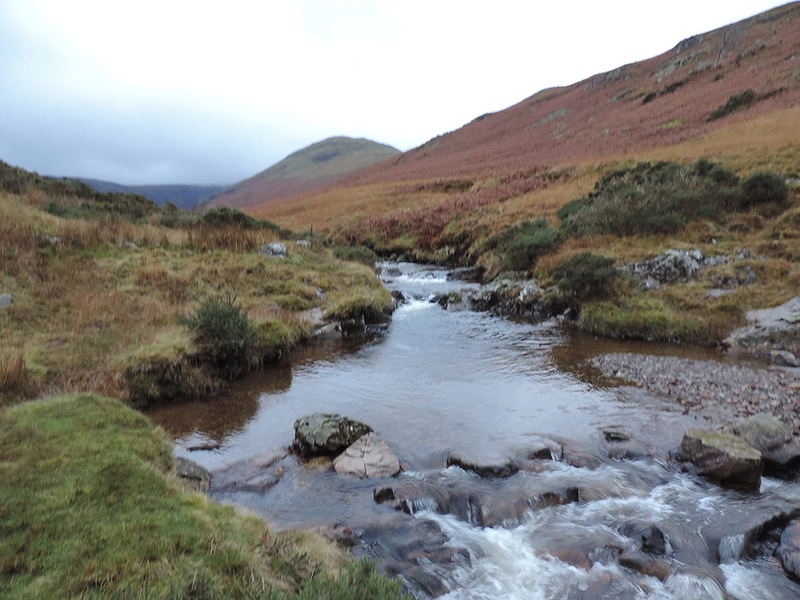 Places visited : Burnbank, Blake Fell, Gavel, White Oak Beck and the Kirkstile Inn. 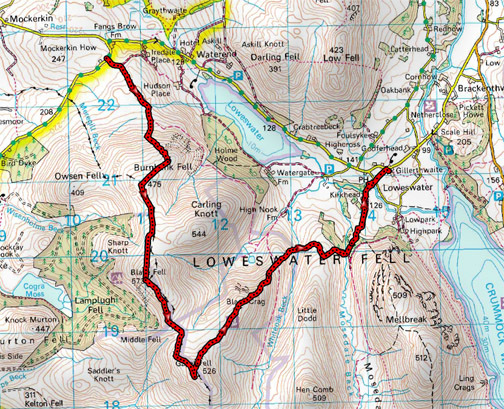 Walk details : 6.6 mls, 1925 feet of ascent (2325 ft of descent), 4 hours 30 mins. 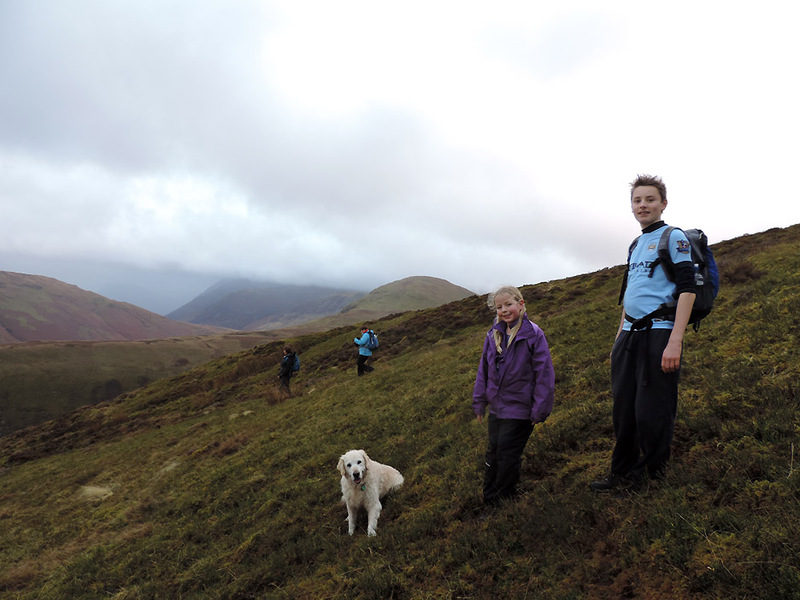 Highest point : Blake Fell, 1,878 ft - 573 m.
Walked with : Paula and Sue, Tom and Abi and our dogs, Harry and Dylan. Weather : Overcast with occasional hill fog, some sunshine and a late rain shower. 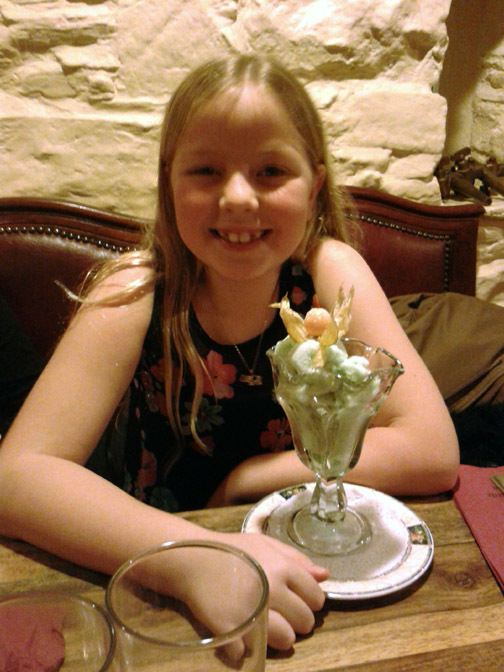 Paula and Al, our grandchildren Tom and Abi, plus Paula's friends Sue and Mark are up for the weekend. 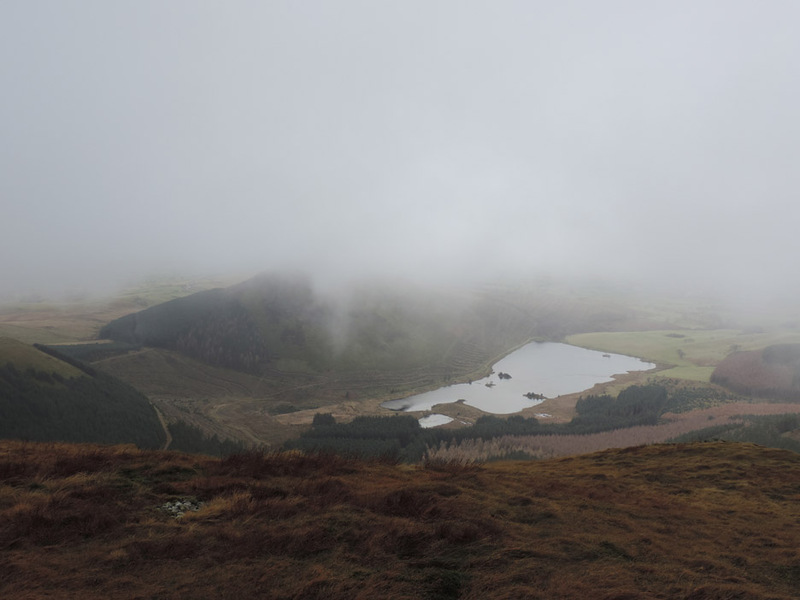 on a walk across the three Loweswater Fells from Fangs Brow to home. Unfortunately the weather over the weekend wasn't as kind to our visitors as it has been to us through the week. The roads are wet as we've just driven through a heavy rain shower before parking at Fangs Brow. The clouds are down on the top but there's brighter skies to the west where the weather is coming from . . . so keep your fingers crossed. Crowd Scene . . . Sue, Tom, Paula and Abi . 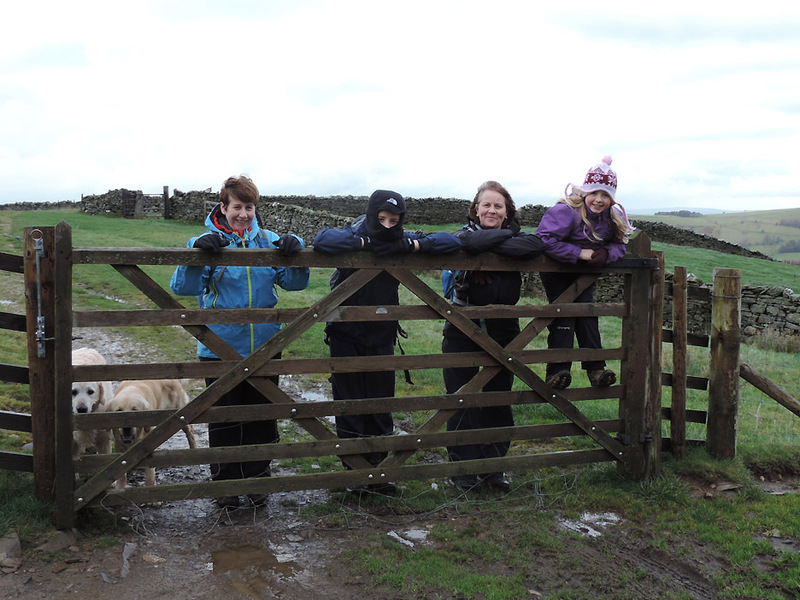 . . shall we open the gate and let them loose on the fells now ? 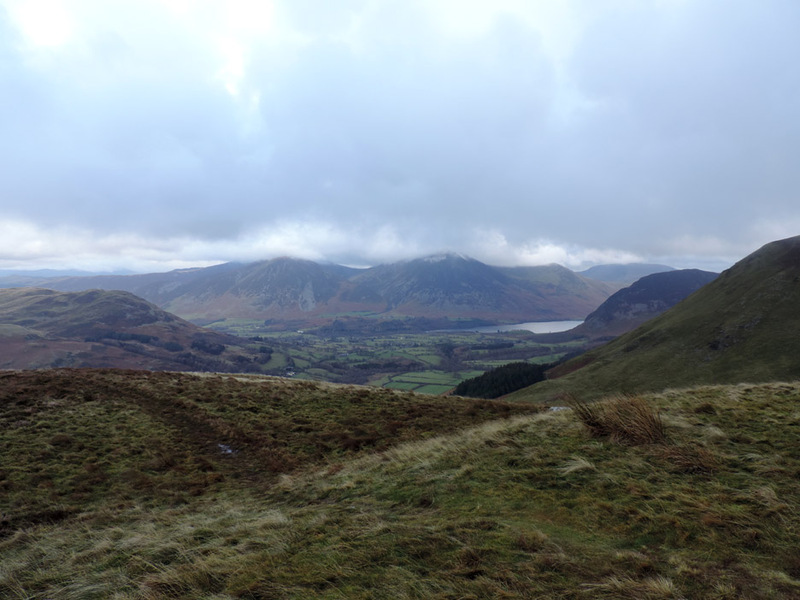 Walking the Coffin Road where we can look across to Loweswater and distant Crummock Water. 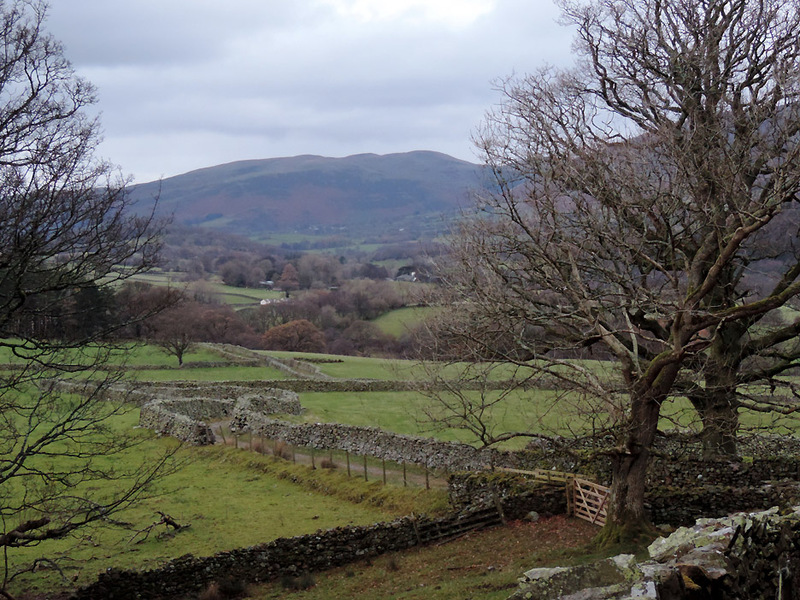 Darling and Low Fells are to the left but don't have the colour Ann enjoyed earlier in the week . . . still we live in hope. There's a definite clearer look about the weather, here looking north over the Solway Plain. 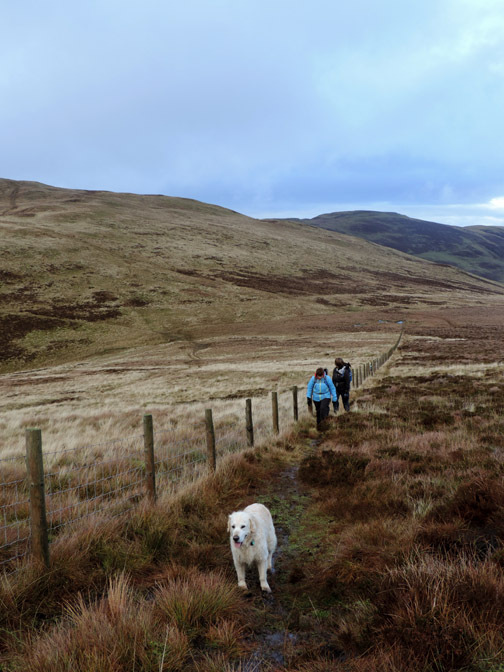 Leaving the track far below as we climb steeply up onto Burnbank Fell. 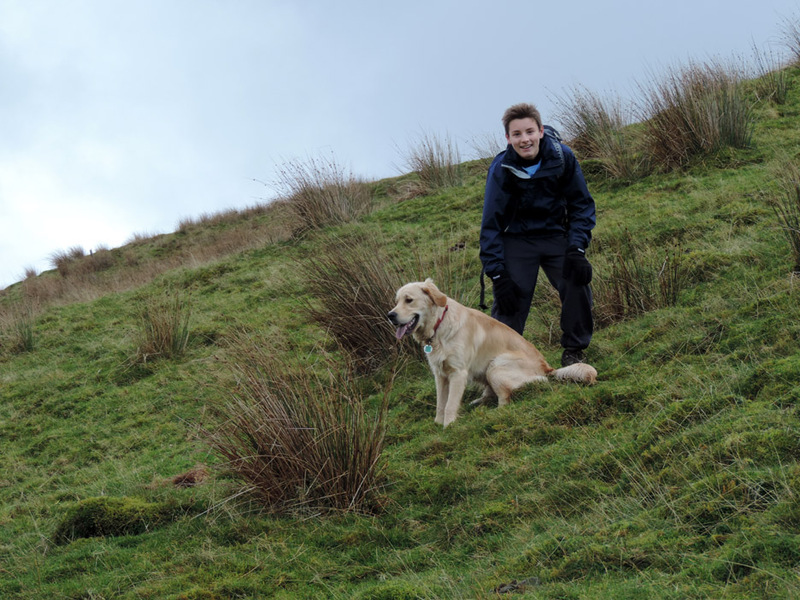 Tom pauses on the steep fell side for us all to catch up. Dylan is stationery too . . . for a change. 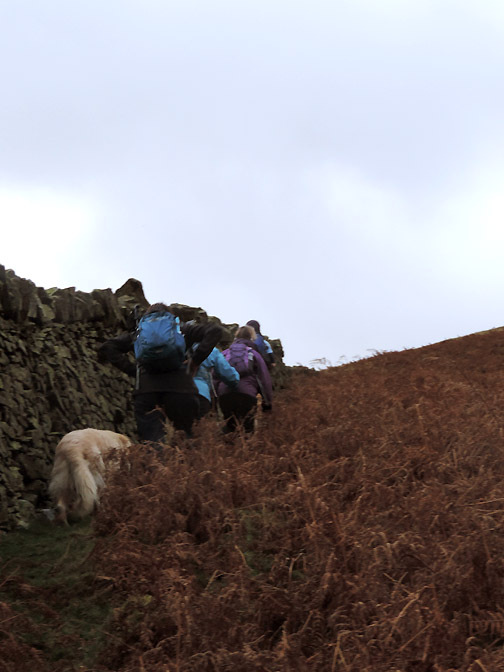 On the top of the fell a path has developed as everybody's ideas of the way ahead coalesce into a single route. 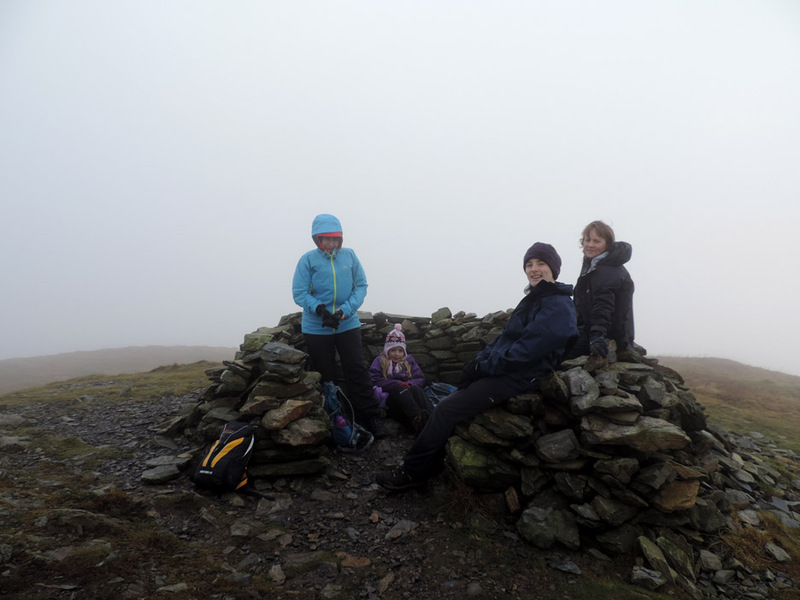 A short while later and we are at the fenced off summit cairn of Burnbank. 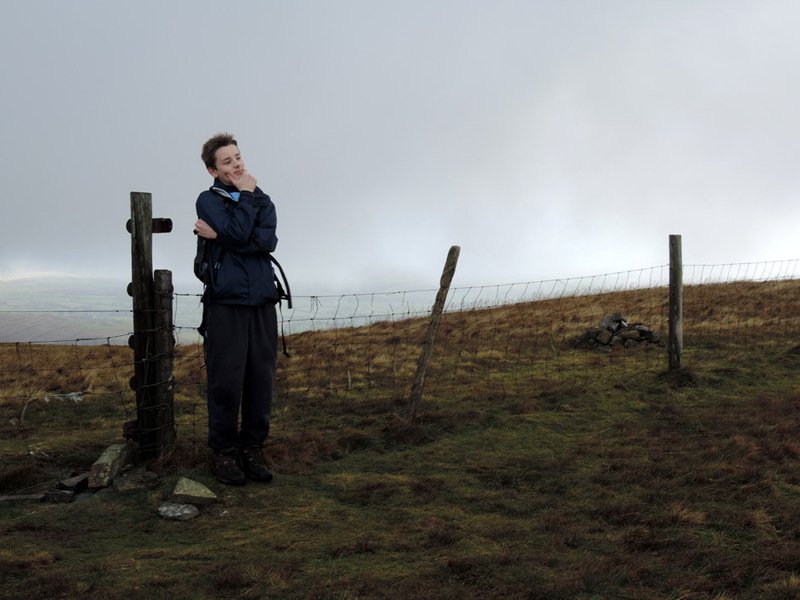 Tom in (teenage) contemplative mood . 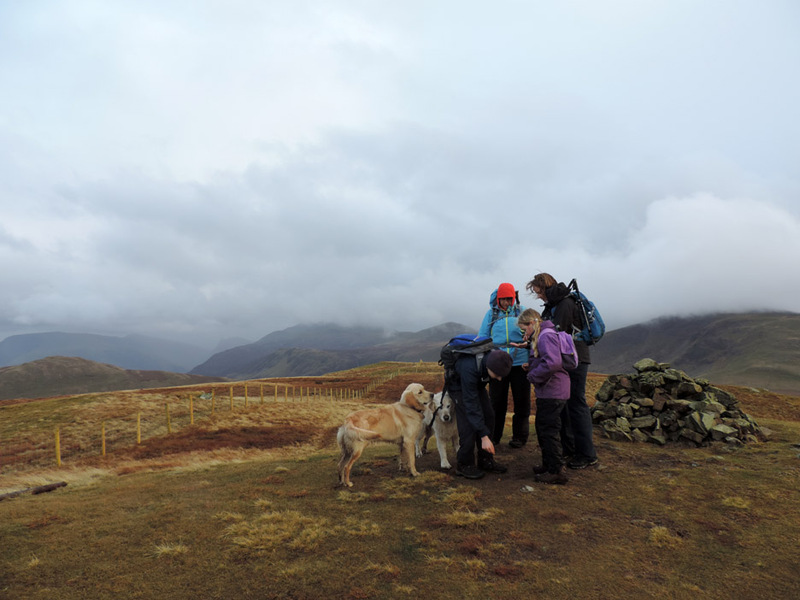 . . "Is it worth crossing over the fence to properly claim the Wainwright point." or possibly he's thinking " Do you think they've noticed my 'Movember' growth yet"
Moving swiftly on . 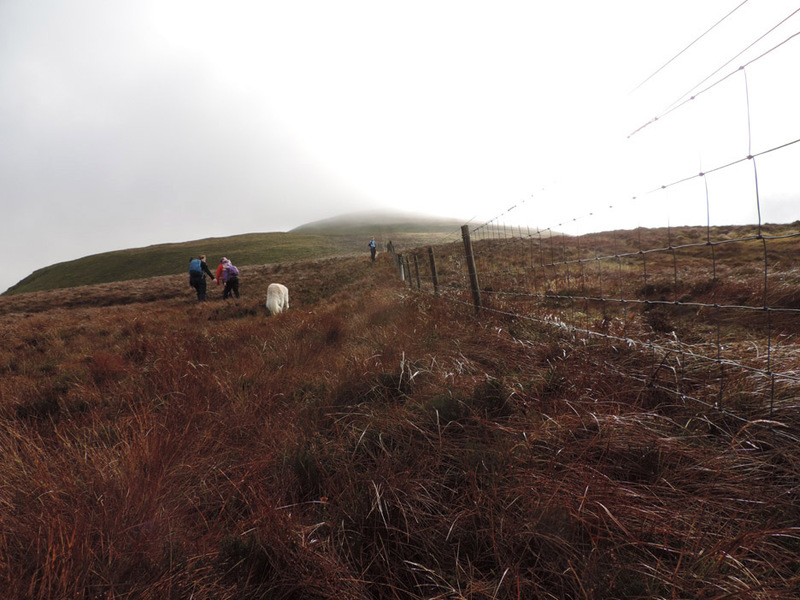 . . we follow the fence line up towards the next summit which hopefully will be Blake Fell. sunshine reflecting off the moisture on the grass and the fence wires. Not for long . . . as we climb the cloud rolls in again . . .
. . . but at the end of the fence is the summit shelter and a spot for lunch. 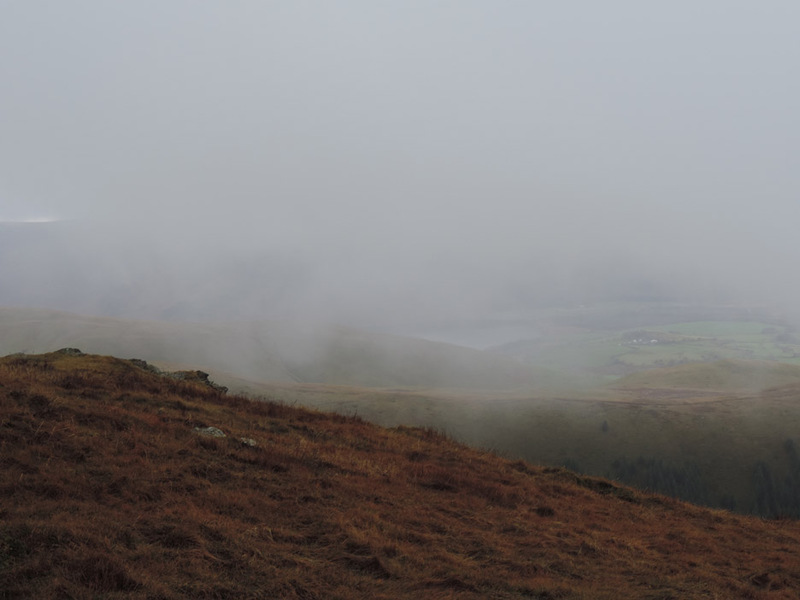 Here on the summit of Blake we were open to quite a strong, damp breeze so the summit shelter was most appreciated. 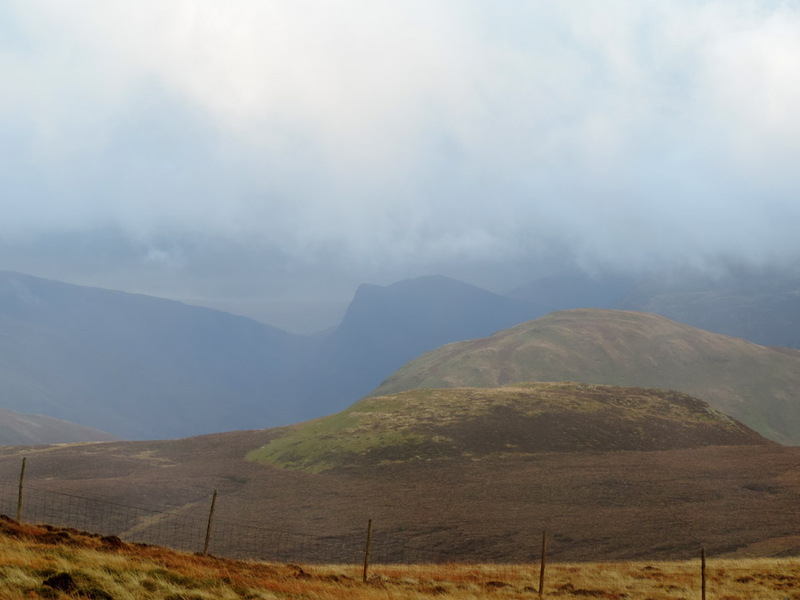 Looking across to Ennerdale as the cloud starts to clear. 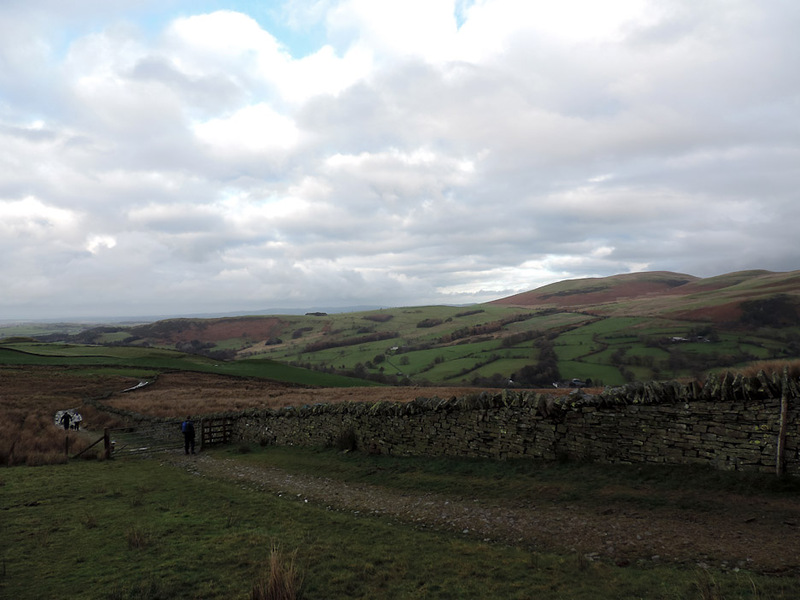 We can also look down on Cogra Moss for the first time since we arrived. 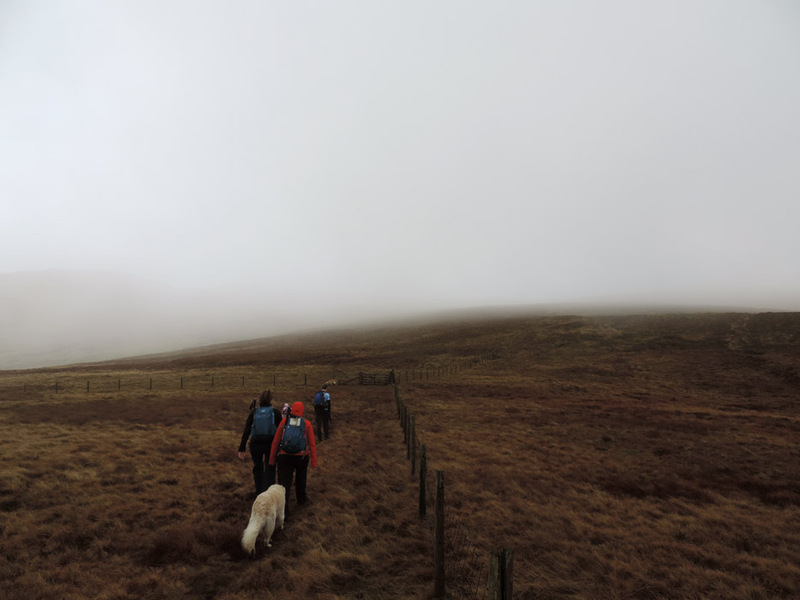 The cloud moved away completely as we descend from the summit, heading across to our third summit of the day, that of Gavel Fell. 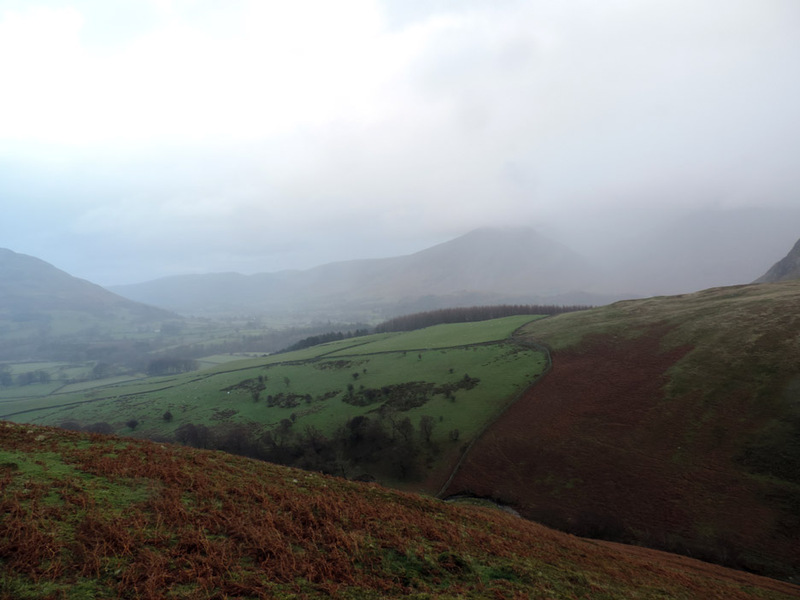 The panorama here covers the view from the High Stile Ridge on the left to Banna Fell and distant Caw Fell on the right. 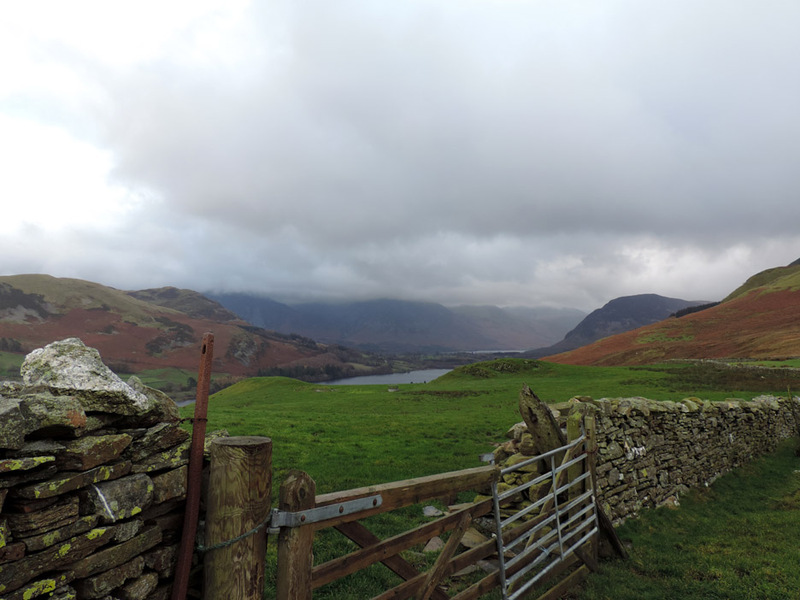 Zooming in on Fleetwith Pike at the head of Buttermere. 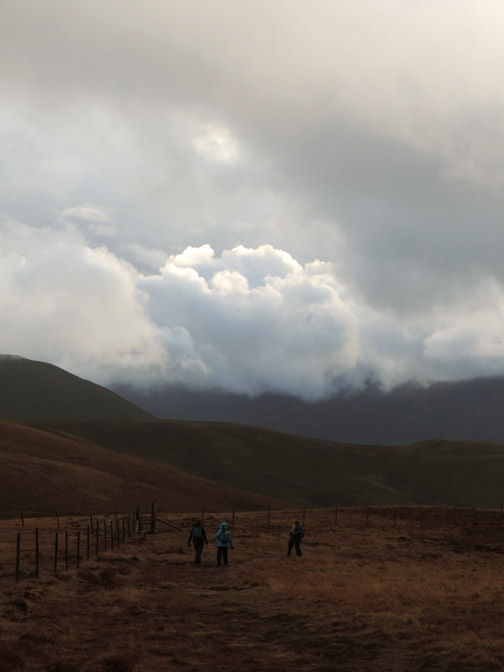 Silver linings once more to the clouds above Ennerdale. Another fence guides us up towards Gavel summit. The top of Gavel and the wine gums are out as a reward. Tom drops one on the ground and reaches down to retrieve it before the dogs notice. 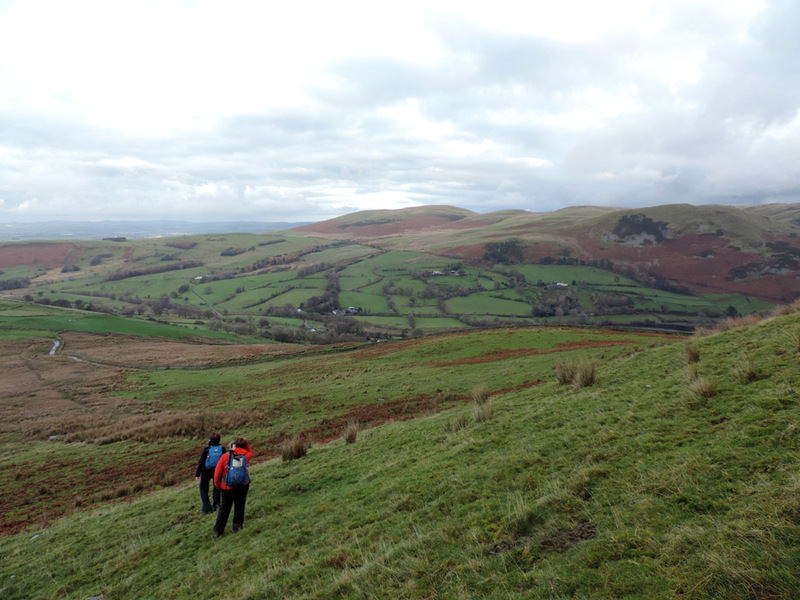 Broad horizons now as we head back towards Black Crag. We could have followed another fence line down directly into the White Oak valley, but this route has more extensive views. Time to start our descent at the end of the ridge. 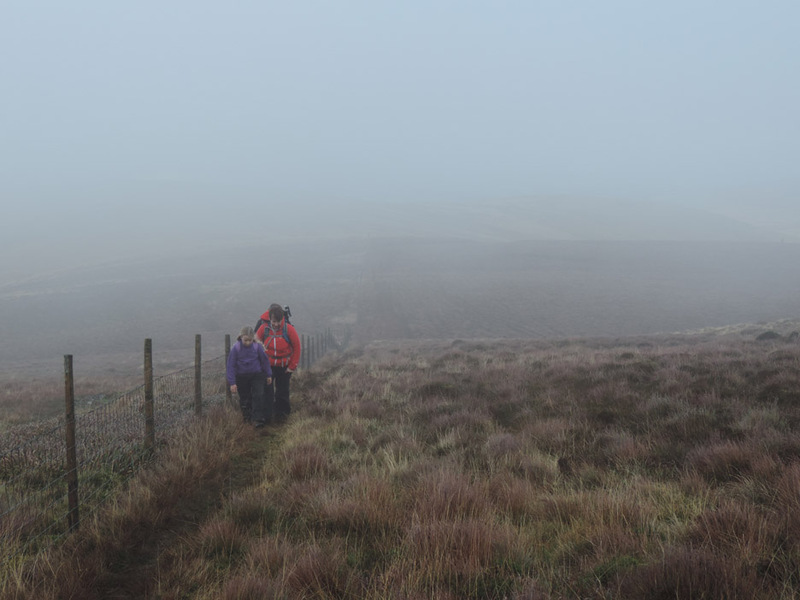 No coats on now as we're out of the wind and there's no sign of any more low cloud. 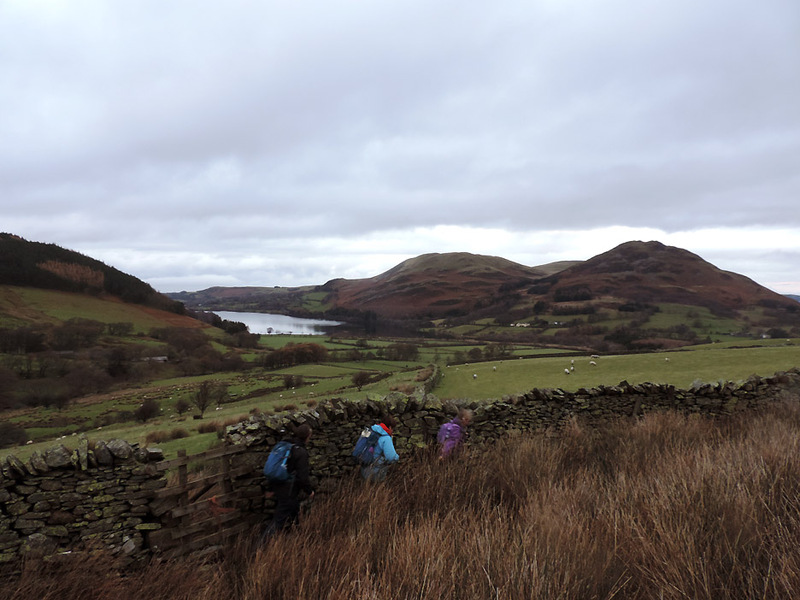 Dropping down, with views of Loweswater and High Nook Tarn to our left. I spoke too soon . . . as it looks like there's some rain ahead. Decisions, decisions . 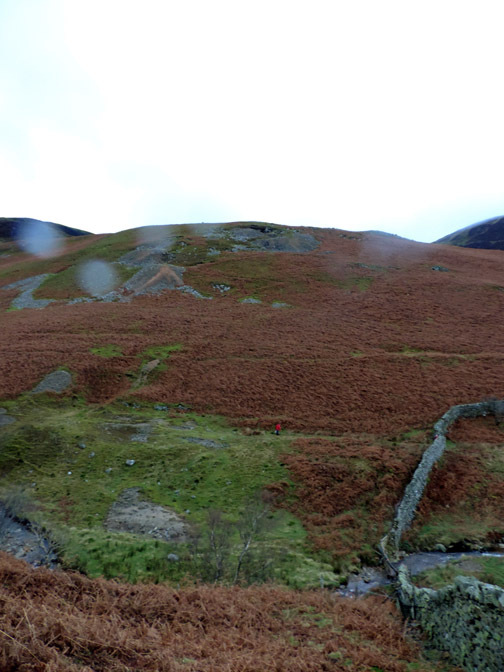 . . to avoid any road walking we decide to head over to the Mosedale Valley following the stone wall opposite. We've already decided to make a break for home rather than head back to the car, we'll despatch someone to fetch it later. The alternative was to follow this current track down to Maggie's Bridge and walk the tarmac to home via the Village Hall. Looking back after Crossing White Oak Beck . . .
. . . with a steep but short climb up the other side. It also includes a few drops of that rain on the lens as it tries to rain once more ! Short and sweet and fortunately the rain stops as quickly as it started. 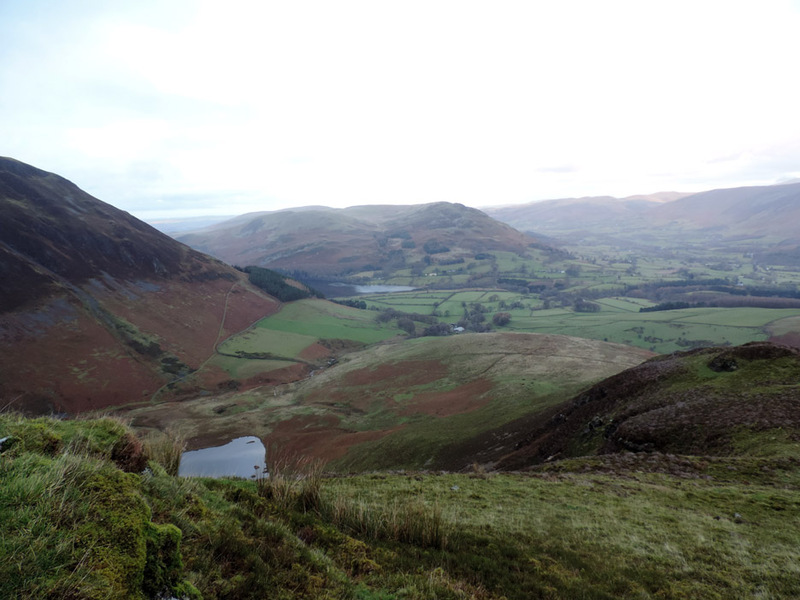 There's a clear view of Loweswater, Darling Fell and Low Fell once again. Harry's pool . . . a rather hurried shot after Harry and everyone had crossed the stepping stones and moved on. Ahead the track leads onward and homeward . . . that's our cottage over there with the white gable end. Perfect timing as the afternoon light fades. 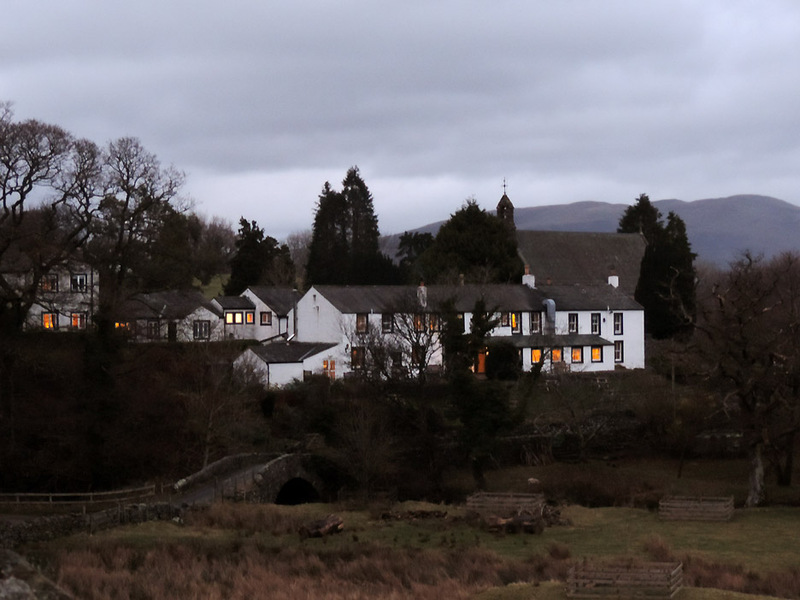 The lights of the Kirkstile encourage us in at the end of the walk . . . after all we need to check our evening booking don't we ! take a shower and change before we head back to the Kirkstile for our table booking tonight. 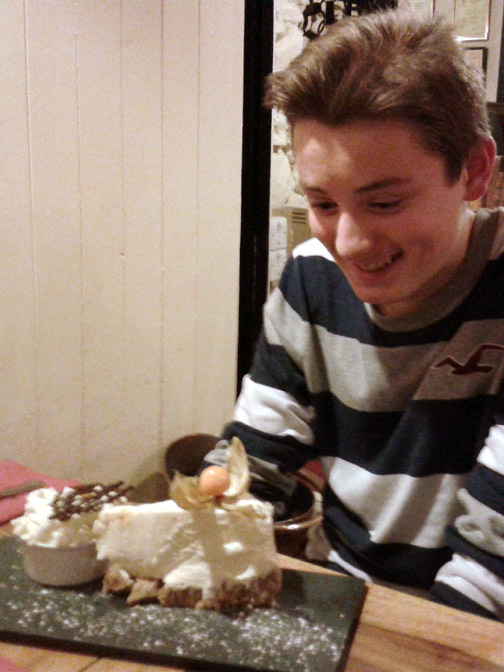 Smiles of delight for Abi's desert after a lovely main course . . .
. . . Tom opts for the cheesecake, almost too good to eat. This site best viewed with . . . the prospect of that meal planned at the Kirkstile in the evening.